The ability to successfully camouflage human body, to hide it and yet emphasize its beauty is probably the strongest quality of Emma Hack. One of the most famous and recognized Australian artists, she’s chosen the unique combination of painting on canvas, body painting and studio based photography for her mediums. The final form is a photograph, but so much happens before it’s all captured in an instant. The Australian flora and fauna, as well as the Oriental influences, are the primary source of inspiration for Hack. Welcome to the world of realism, but a magical one indeed. Her style could be categorized as body painting based installations, but don’t forget about the photography. Even if it’s ‘only’ the finalization of the hard work and takes a lot less time (in comparison to the painting), it’s the photography that the viewers see in the end. If they are not lucky enough to be in one her exhibitions and actually able to see live models. She is best known for her Wallpaper series that lasted between 2005 and 2010, and in which she used the truly remarkable designs of the late Florence Broadhurst to camouflage her models. 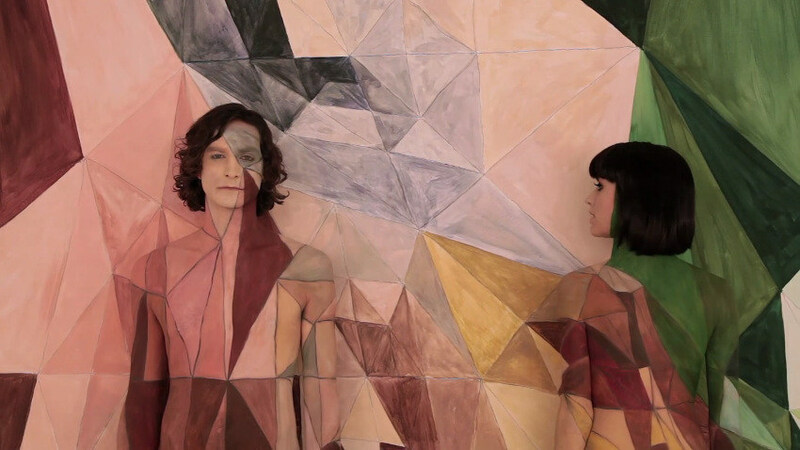 If you’re among almost 750 million people who saw the video for Gotye’s Somebody That I Used To Know and wondered who was behind the body painting, seek no more. Altogether, it took incredible 23 hours for the video to be completed. Hack worked closely with Wally (Gotye) on the design of the background, reworking the image so it could work perfectly with the camouflage elements she is known for. The artwork of Gotye’s father, Frank de Backer, was the inspiration for the background. Director of the video, Natasha Pincus, wanted the bodies to appear to be in a relationship while blended with the background, at which point the Kimbra will begin to leave the relationship while the paint disappears from her body. It was very different from Hack’s ordinary work, where she creates in a calm environment with her regular models. The video was alike a commercial work, where the client’s wishes are in the first place, and that kind of pressure takes an emotional toll on Emma. Emma knows how hard her work actually is and just how much patience it requires. It takes anywhere from 8 to 15 hours to paint, depending on how complex the design is. That why she’s given up on the idea of working with famous people, and only seeks the right models to work with, and when she finds them, it tends to grow into a long lasting relationship. In 2014, she opened her own gallery and studio in Adelaide, and in the same year, she launched the Emma Hack Art Prize, offering both money and the opportunity for young south Australian artist to exhibit. In 2015, the theme was ‘Humanity in the environment’. All the artwork submitted were available for sale, and a part of the proceeds was donated to the Australian Marine Mammal Welfare and Rescue Organization (AMMWRO). With the plans of moving into the 3-D photography, Emma doesn’t think of herself only as a body-paint artist anymore. In the last decade, her work has evolved. It was about the images in her mind she wanted to create and capture. Imagery is everything, and the job is completed when she captures the wanted image. Hack explores the relationship between painting and photography, submerging her painted models into the playful, dreamy background. Even though they are almost perfectly camouflaged, the form of the body and its beauty can still be seen, and those are the moments she wants to capture and immortalize in her photography. Emma Hack lives and works in Adelaide, Australia. Images copyright Emma © Hack.